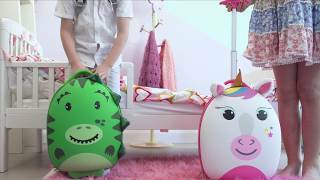 The boppi backpacks are a fun way for children to carry their books, bottles, toys and teddies on adventures near or far. Adjustable padded arm straps with a central clip-lock harness offers comfort and the 1m detachable walking strap makes the boppi backpacks suitable for energetic little ones in busy places. The double zipper access opens up to an overall storage capacity of 4 litres with an elasticated mesh pocket and valuables pouch. The top handle allows for carrying by hand or hanging on a hook. A robust outer casing makes the backpacks durable and hardwearing and each backpack comes with an inner name card and stitched holder.